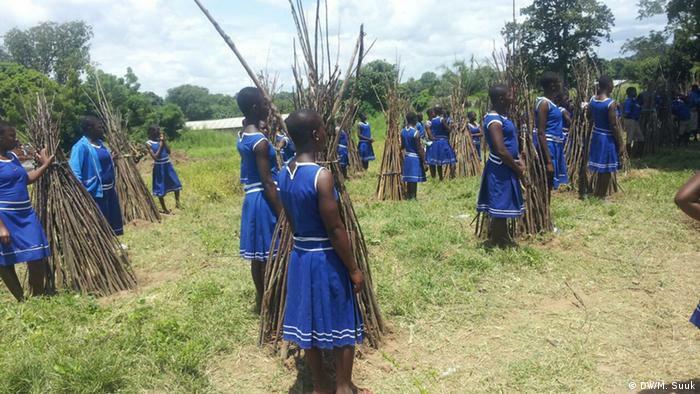 The Ghanaian government is sounding the alarm over forest decline and wants millions of schoolchildren to plant and nurture trees. But a 'greener Ghana' has its critics. It is a bumpy 35 kilometer (22 miles) drive from Tamale, northern Ghana's regional capital, to the village of Nanton. In the dry season, the men hunt for meat, cut wood for rafters or burn it for charcoal. The women carry huge logs of wood on their heads either for home use or for sale. 46-year-old Abdullai Fuseina, a mother of five, sharpens her machete as she prepares to enter the forest. Standing in a field which was once dense forest, she tells DW she makes a living by cutting down and collecting wood. "When I cut the wood, I get someone to buy it. That's where the money for food and my children's school fees come from," she said. 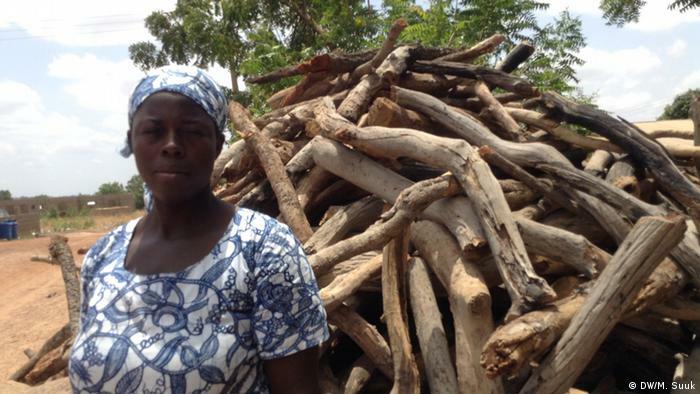 An estimated 80 percent of Ghanaians depend on the forest for their livelihood. But as they use its resources to survive, they also end up degrading the environment. Mahama Ayariga, Ghana's minister for environment, science, technology and innovation, was recently in the northern region to campaign for a government reforestation scheme. "Given the rate at which the Sahara is inching towards us and the rapid deterioration of our forest cover in this part of the country, we must initiate an aggressive program of tree planting to be able to fight back," he said. They have been several attempts at reforestation in the past but they were not very successful. This time the ministry has set an ambitious target of planting 30 million trees. It is seeking to enlist the support of traditional leaders and the younger generation. "There are five million schoolchildren in this country. If we give every child just two trees to plant then that's ten million trees," Ayariga said. Pilot schemes are already under way in selected Ghanaian schools. The ministry has partnered with an NGO which has agreed to supply the school students with school bags. 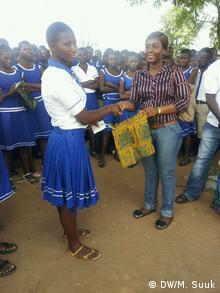 A school student that has successfully nurtured a tree receives a bag as a reward. Yaw Atuahene Nyarko, northern region manager of Ghana's forestry commission, is pleased with the results. "Not even one seedling died, because we have one kid to one tree and they are taking good care of them. At a tree nursery in Tamale, they are growing seedlings for this huge tree plantation project. But Nyarko is aware that those who use the forest's resources and those who plant trees can have diverging interests. "A whole lot depend on the forest, it's always a conflict, for example, when somebody is hungry," he said. Other threats to the environment include chainsaw operators, cattle grazers, bush fires and lone gold miners. Back in Nanton Abdullai Fuseina has gathered in her wood for the day. Under Ghana's new forestry scheme, she will be barred from doing this in future. She thinks that this is wrong and that the government ought to offer her, and others like her, an alternative means of earning their living. "They should give us work to do. How can I stop? How can I cater for my children?"